Wallace, NC Bojangles'® Tands, INC. Store #49 - Bojangles'® / Tands, Inc.
Have a craving for some of the best fried chicken around? 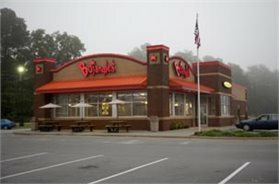 The Bojangles location in Wallace, NC at 110 Vines Landing is proud to offer our delicious meals and famous sides! Come visit us for breakfast, lunch, or dinner and enjoy the recipies that make Bojangles so great!